Artwork inspired by Star Wars: Episode IV - A New Hope. Paper print measures 22-inches wide x 17-inches tall. 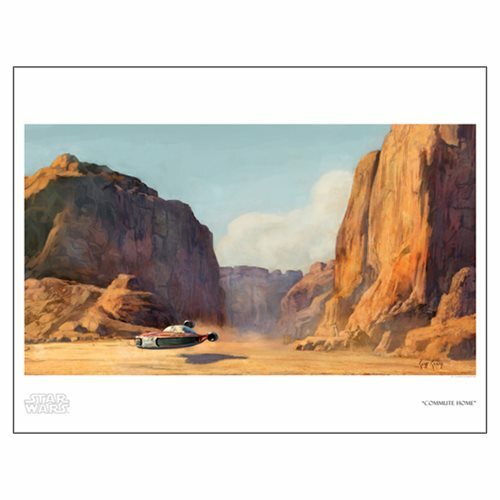 Interpretive artwork inspired by Star Wars: Episode IV - A New Hope, this captivating Star Wars Commute Home by Cliff Cramp Paper Giclee Art Print is a limited edition of only 150 hand-numbered pieces. The marvelous unframed giclee on paper measures about 22-inches wide x 17-inches tall, with an image size of 21-inches wide x 11 3/5-inches tall and comes with a certificate of authenticity.